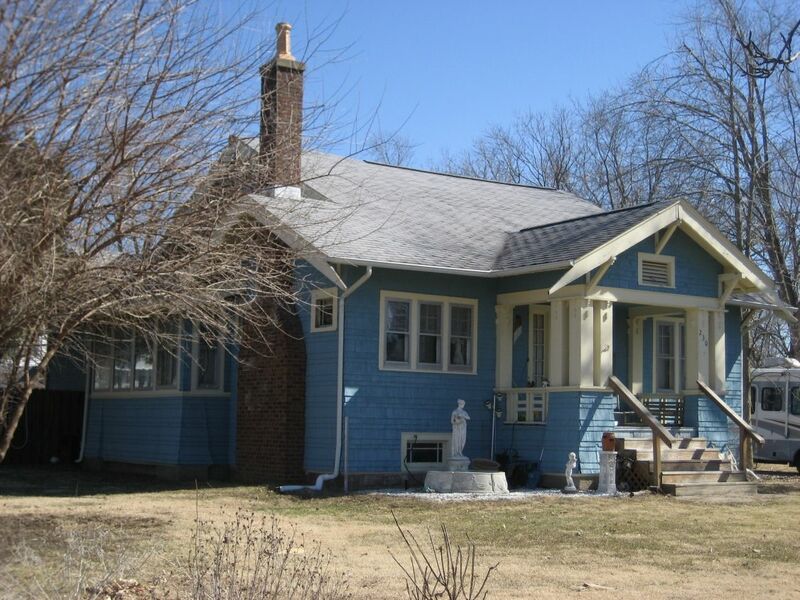 The Sears Ashmore was not one of Sears most popular designs, but it surely was one of their prettiest, and it was a classic Arts and Crafts bungalow. And it had a pergola, too! 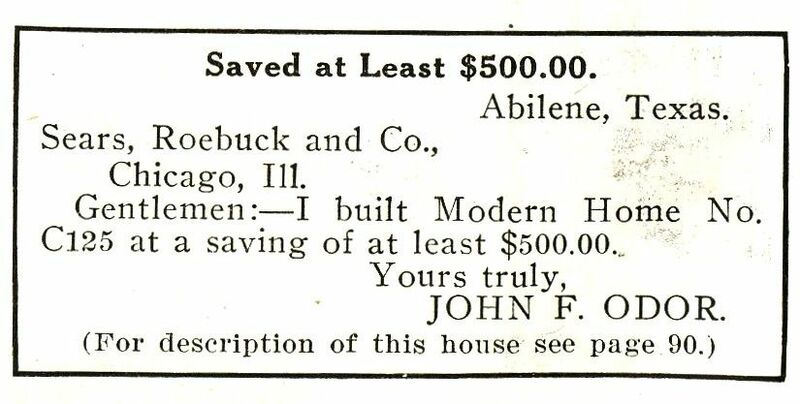 According to the testimonies that appeared in the catalog, there are Sears Ashmores in Abilene, TX and Fargo, ND. 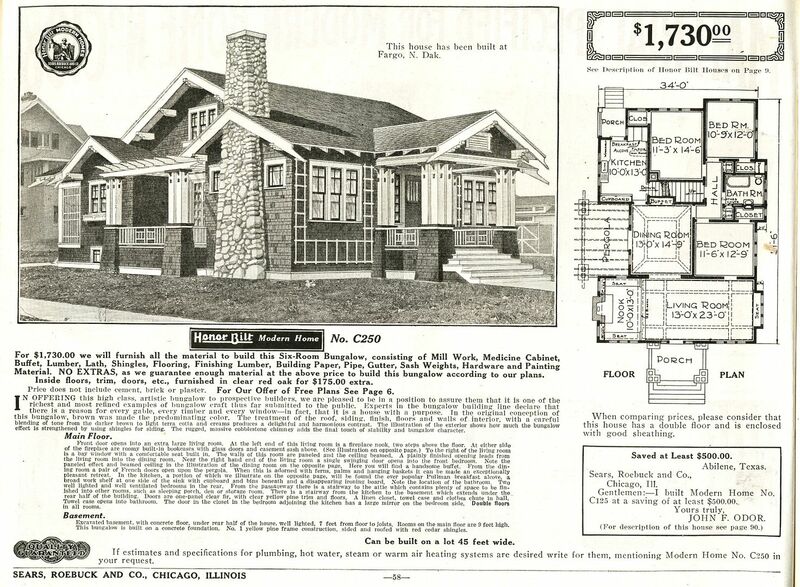 This bungalow was a classic Arts & Crafts design (from the 1921 catalog). And there's one in Fargo, too. Can someone run up there and get me a photo? 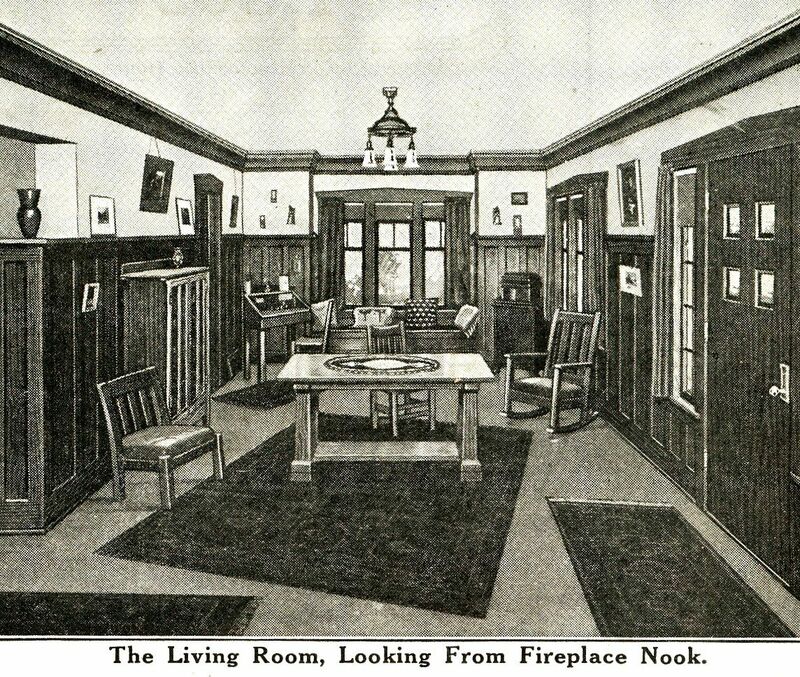 The Ashmore was a spacious house with lots of nice features. And it was a departure from the simple foursquares that were the bread and butter of the Sears Modern Homes catalogs. The living room and dining room both have coffered ceilings, and there's a fireplace nook at one end of the massive living room, with a window seat at the other end. 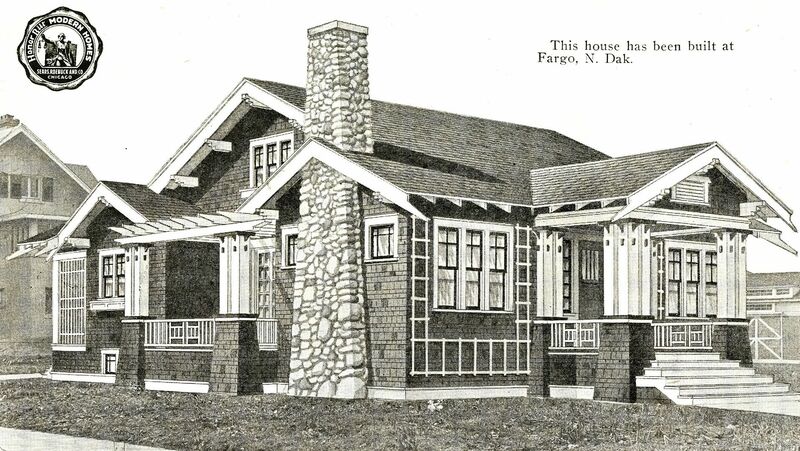 Here's an image from the 1916 catalog. 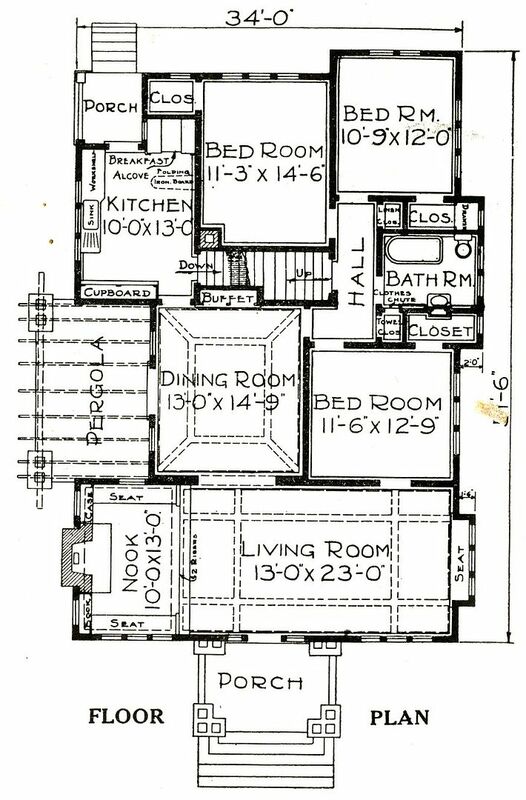 Pre-1918 (before Sears Homes had names) this was the C250 model. "The Ashmore" sounds much more elegant. According to the page above, there’s also a Sears Ashmore in Fargo, ND! I’d like a photo of that, too. 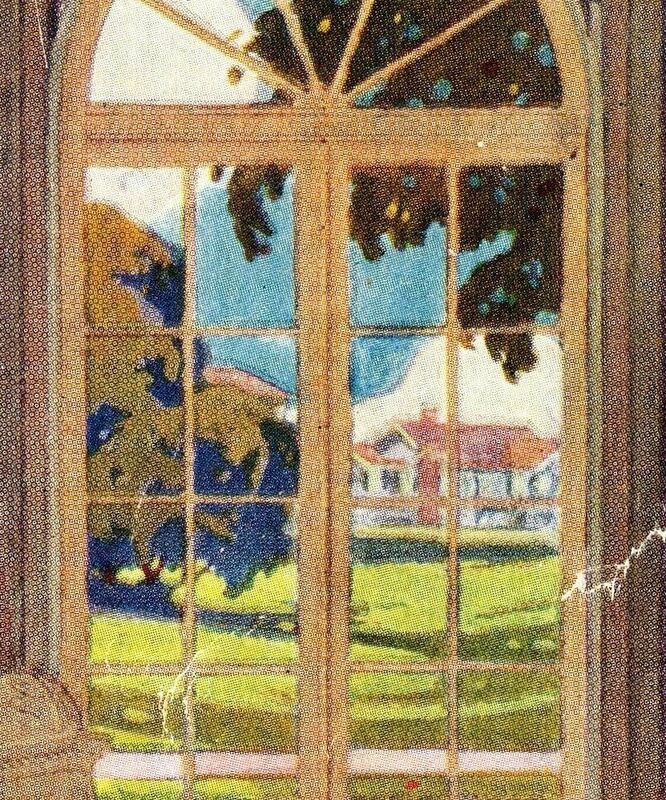 The cover of the 1921 Sears Building Materials catalog shows an Ashmore in the background. Sears must have been very proud of their Ashmore, too. For more than a dozen years, interior "views" of the Ashmore were featured in two-page spreads. Only the more impressive houses were given two full pages in the old catalogs. 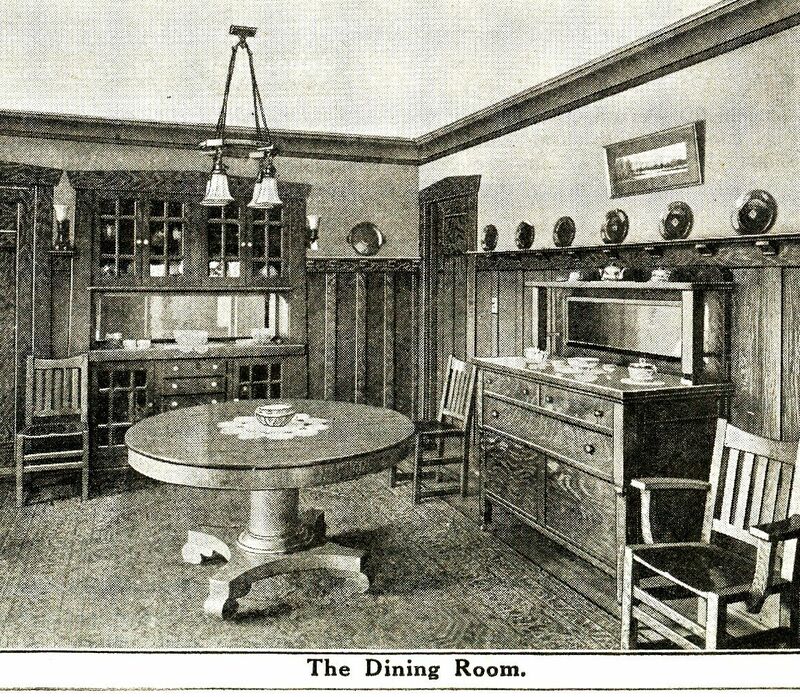 The dining room (shown above) is outfitted with classic Arts & Crafts pieces. The oak wainscoting (topped with plate-rail) is shown, but not the coffered (beamed) ceiling. One end of the 23-foot-long living room had a window seat (shown above). And the other end had a fireplace nook. 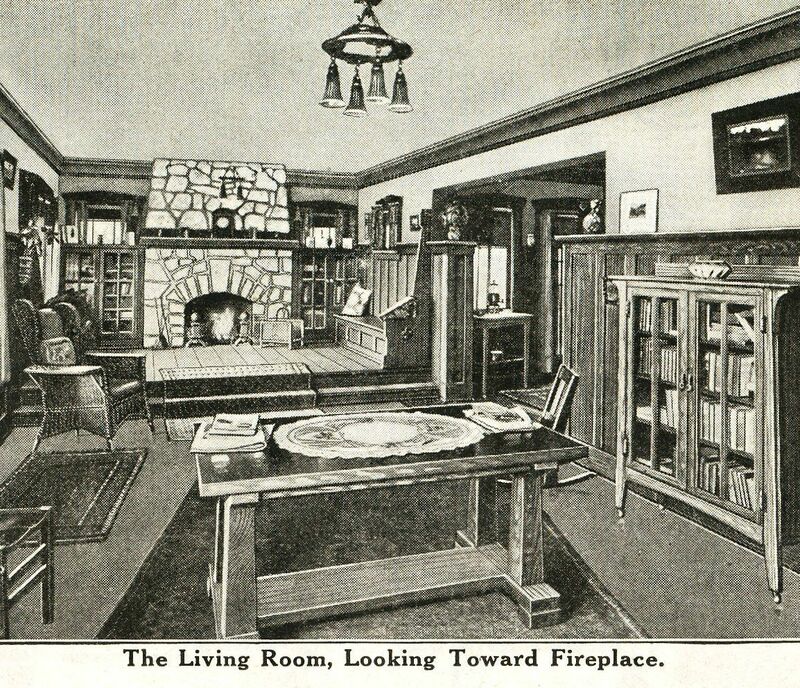 Arts & Crafts bungalows were all about nooks. Here's a breakfast nook, complete with classic trestle table. According to the floor plan, that's an ironing board in the wall to the right of the nook. And here's the world's most beautiful Ashmore. Not too fond of the color, but it is in wonderfully original condition. It's in Waverly, Illinois and it's featured in my book, "The Sears Homes of Illinois." The A&C movement was characterized by earthy colors of browns, tans, dark green and other muted colors. Electric blue with yellow trim doesn't do it for me. But thank goodness, it's in original condition and the vinyl siding salesmen have not decimated it. Doesn't that warm the cockles of your heart? Compare it to the house above, and you'll see it's a perfect match. My oh my, that's a sweet-looking house! If this doesn't make your heart leap with joy, you should stop what you're doing right now and make sure that you still have a heart beat. Look at these porches. 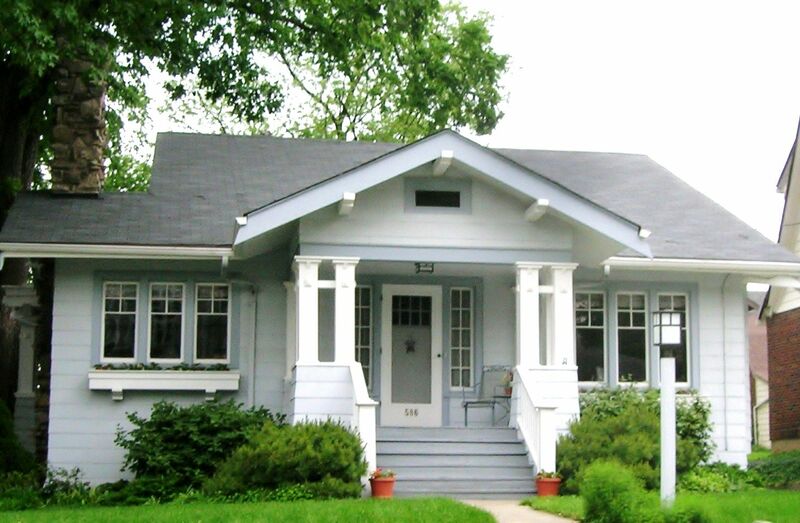 This sweet thing in Waverly still has its original porch railings. This beautiful Ashmore is in Cincinnati. Apparently, blue is a really popular color for the Ashmore! Photo is copyright 2011 Donna Bakke and can not be used or reproduced without written permission. And here's one in Ocean View (Norfolk), Virginia. Isn't it dreamy? To become fascinated by yet another old story that Rose is involved in, click here. To read about how and why the bungalow became so popular so fast, read here. If you’ve visited this site more than ten times in the last year, state law requires that you leave a detailed and thoughtful comment below. Okay, not really, but I wish you would. Gorgeous examples! The Ashmore and the Osborn are two of my favorite designs. Possibly even my top two! We have been enjoying life in our beautiful Ashmore home for the last 34 years in Gordon, Pennsylvania. With the exception of a kitchen remodel to achieve more space, our home is true to the original details. 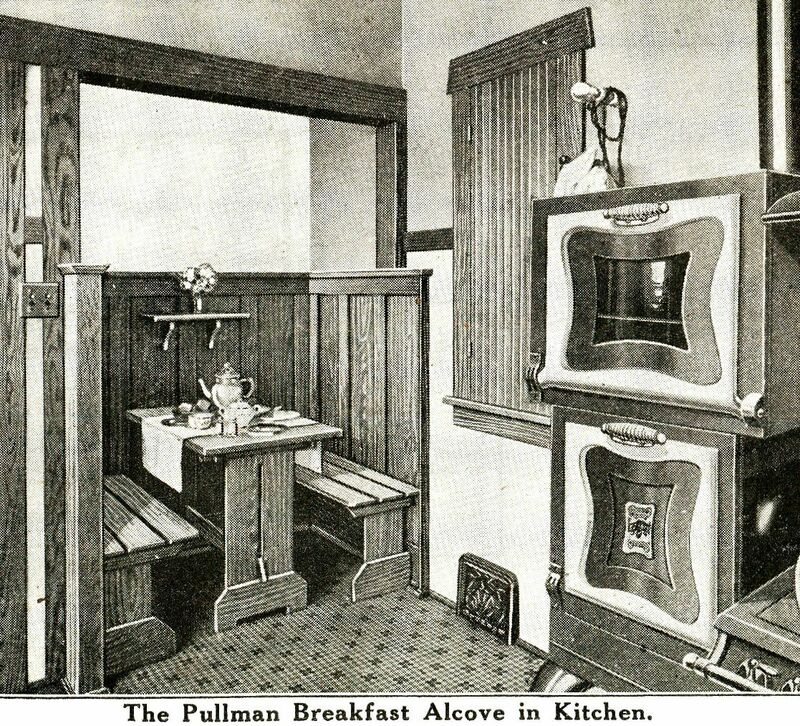 The original features and lines of the kitchen were considered and incorporated into the new kitchen design. We have had many positive comments and visitors stopping by to admire our lovely bungalow. We have a beautiful Ashmore in New Berlin, Il. Built in 1915. It was a wedding gift to my husband’s grandmother. There is one in Dayton Ohio, my finance and I just bought it. While looking for an apartment for my sister, I came across an Ashmore in northwest, Pennsylvania . Loved it so much I went back the next day to take a few pics in hopes of identifying it. The owner came out to find out what I was doing and after a few minutes took me inside to see it! Best thing that has happened to me in years. I have never seen anything so awesome in my life and pretty close to all original. I am still shaking from excitement! The owner will never know how happy he made me. He confirmed it is an Ashmore. In 95 years, he is only the second owner of it. So including the ones mentioned on this page and the one being sold in Minneapolis and my find, that makes 10 of them, double the amount I have read existed. Awesome! Wish one was mine! Only 10? I know of one in Birmingham, Michigan. Is that on your list? Since the Ashmore is not in any of my books and I just found out it existed, along with not being a well travelled person, no I am not aware of that one. I had read that there were only 5 existing, so I was counting the ones in the photos and the ones mentioned on this page and only added the one I found and one that I read was in Minneapolis. That made 10. Now we can make it 11. I wish we knew for sure how many were out there. Unfortunately, there’s a LOT of misinformation out there on Sears Homes. Where did you hear there were only ten? 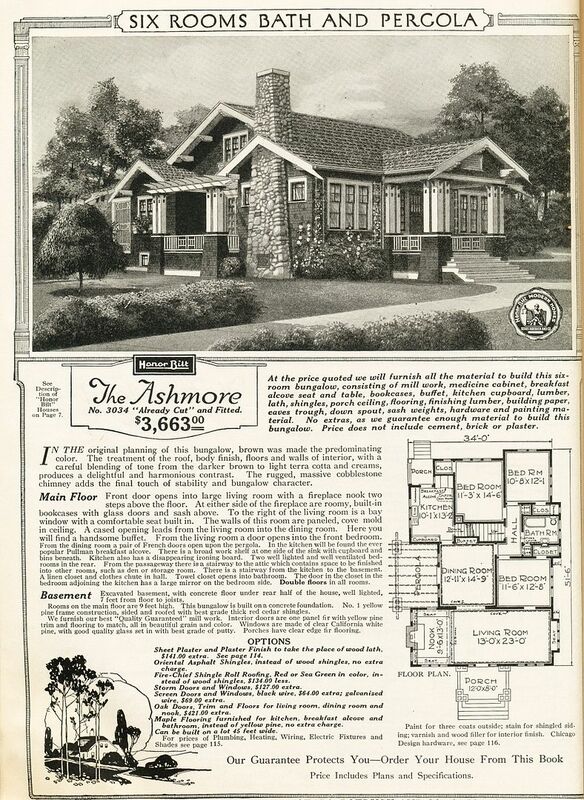 The Ashmore was a beautiful house, and a classic Arts & Crafts design. On our Facebook page (”Sears Homes”), there are some Ohio residents and I’d bet that they’ve found ten Ashmores in Ohio alone! Rose - That may have gotten started here. As I said to Andrew, I had read there were only five, and I was calculating the ones mentioned on this page and adding two others that that I was aware of. I also said I wonder how many more are out there. I most certainly wasn’t stating for a fact that there are only 10 in the country, because I would not have any idea how many there are. I also read a newspaper article that stated there were only 3 confirmed Ashmores in the country. If I find those two articles I could forward them to you if you wish. I do agree the Ashmore is a beautiful house regardless of how many there are. I live in New Berlin, Il , in an Ashmore built in 1914 (initially identified as built in 1915). There is another Ashmore in same town. We have done some retrograde work on the house , as the kitchen had been remodeled in the 1970’s. We were quite surprised when we remover the area rug in the dining room and found a beautiful lineoleum mosaic floor. It was all cracked between kitchen and dining room. We had it redone in wood–it’s beautiful and looks just like the old floor. It was entered in competition for “restoration” floor. It won nationally “Best Restoration 2014″ award! You can view it on internet. National hardwood flooring. Enjoy. We are thinking about trying to have one built. I have never seen what the 2nd floor looked like. I’m not sure when you posted this. Have you sold your home yet? I can’t find the pics of best restoration 2014. Is there a specific website or could you send me pics? Hi Carol, I’m from Scranton, pa and wondered if I could drive by your house to see it in the flesh. I do love that house and would like to build it this year. I assure you I’m not a nut just a lover of Sears kit homes! 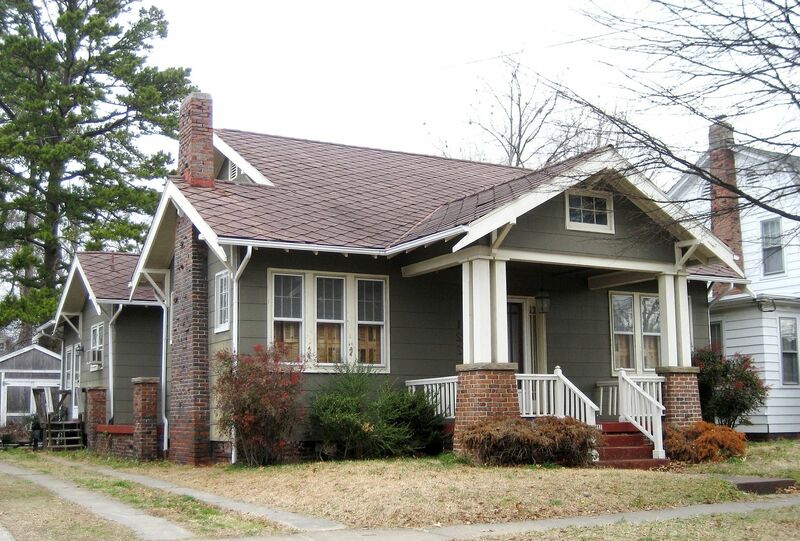 This is actually a C125 home not an Ashmore C250 and was built in 1912 and it’s still in standing. I have a photo if you can send me your email address. I found your site after listening to 99% invisible- fascinating! My parents live in Ellicott City, MD, where a Sears house still stands on Sears House Ct. My husband and I just moved to Fargo, ND, and with the number of houses here built in the early 1900s, I wondered if any of them are Sears houses. My search led me to this post. I’d be happy to keep an eye out for the homes. Do you have any more information on them?